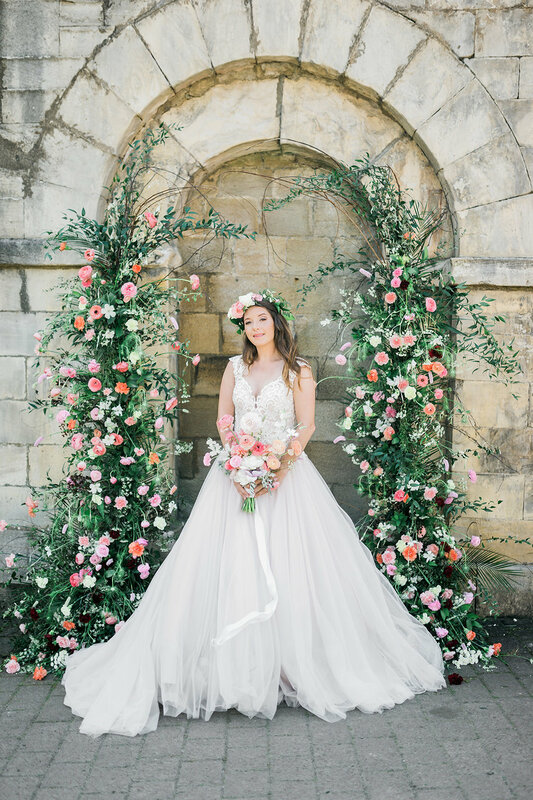 Last year, we were invited to join Emma- Louise, the Yorkshire Bridal blogger on her romance inspired bridal editorial at Hazelwood Castle. 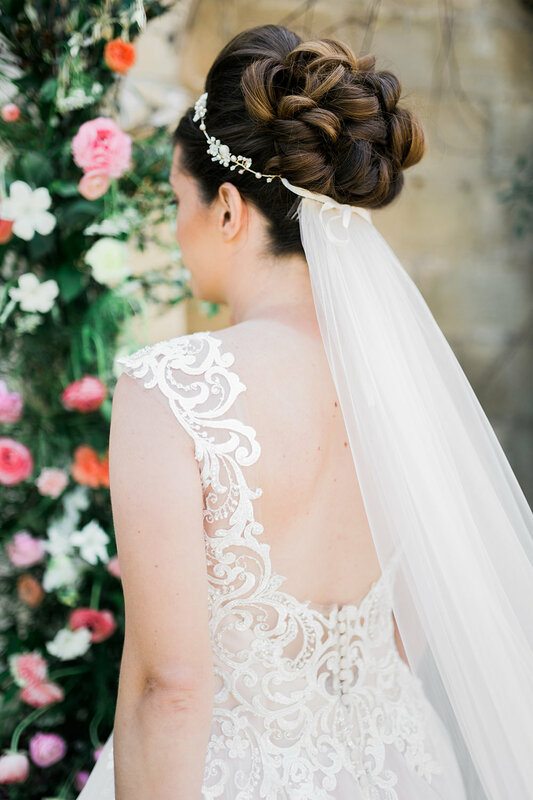 It gives me great pleasure to share with you her blog and the casting who were directly involved in this styled shoot. 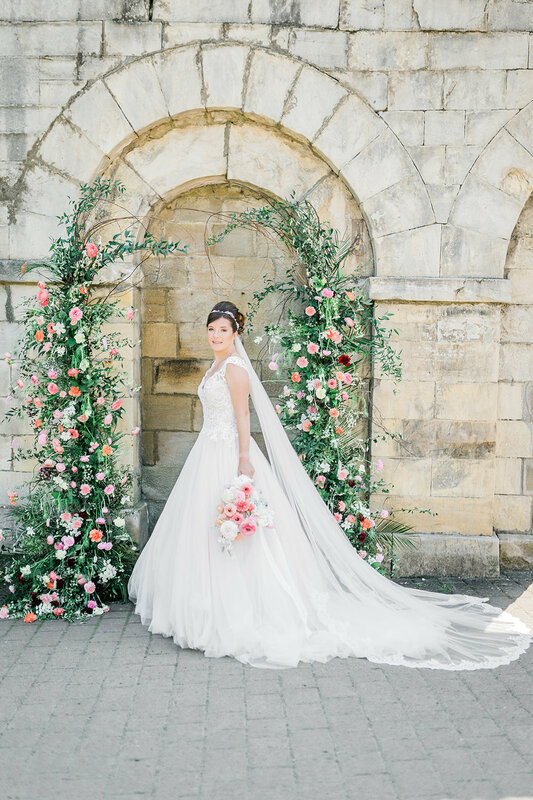 “I'm so excited to share this romantic styled shoot with you today! 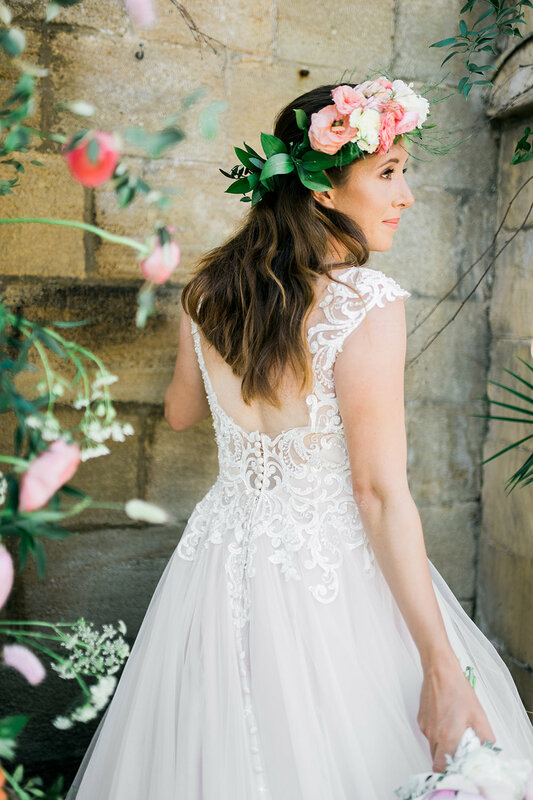 It was an absolute pleasure to work with some of Yorkshires finest wedding suppliers. 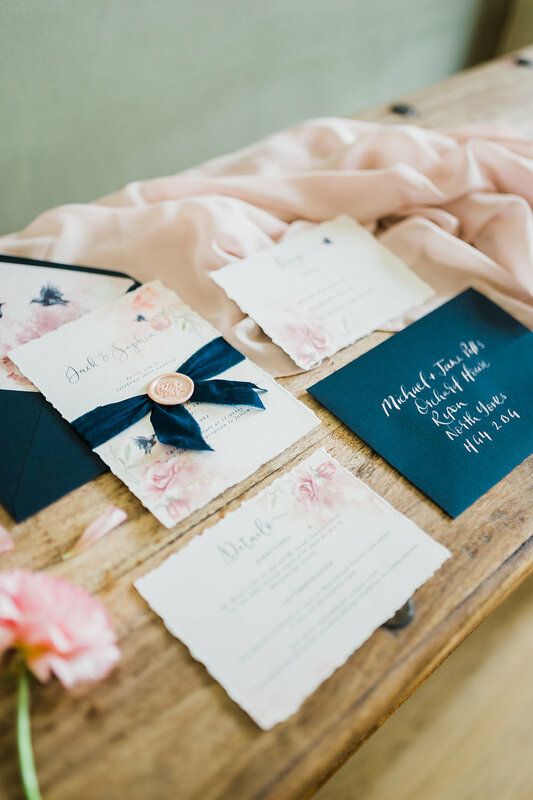 The concept for the shoot was romantic, soft and feminine with blush and navy tones. Arabella Smith captured the shoot perfectly with her fine art photography. 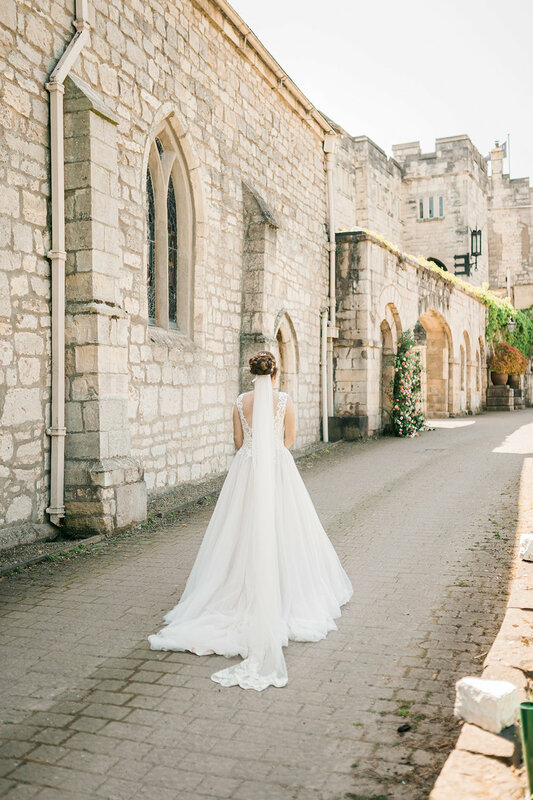 I saw the beautiful Allure dress from Elenor Rose Bridal and instantly fell in love, it fitted the concept perfectly. The venue was my first choice you can’t get any more romantic than a castle. It really is the perfect back drop for a romantic wedding. 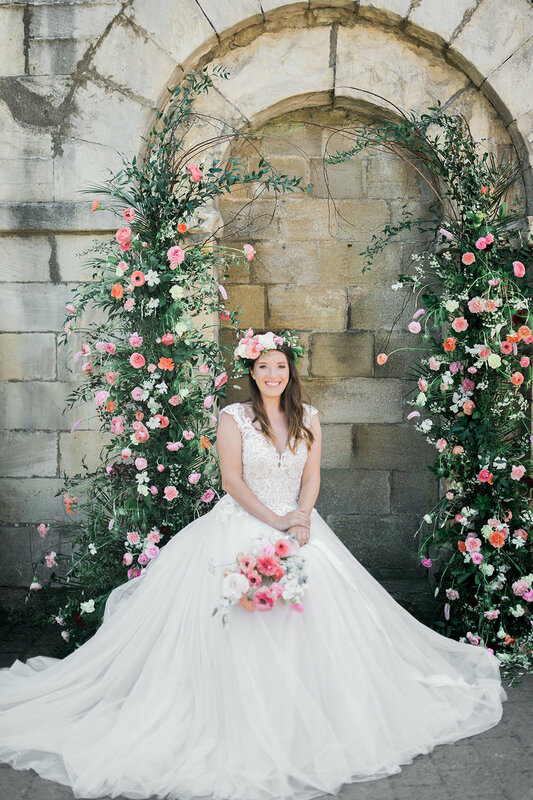 Ambience venue styling created a stunning table to set the scene and a huge blossom arch stood in the court yard where we hung the seating plan it looked amazing. I opted for favour cakes rather than the traditional wedding cake from Choos cakes and they looked beautiful and they tasted as good as they look! Your Days by Design created the most beautiful stationary fitting perfectly with the concept along with the table plan which was absolutely beautiful. 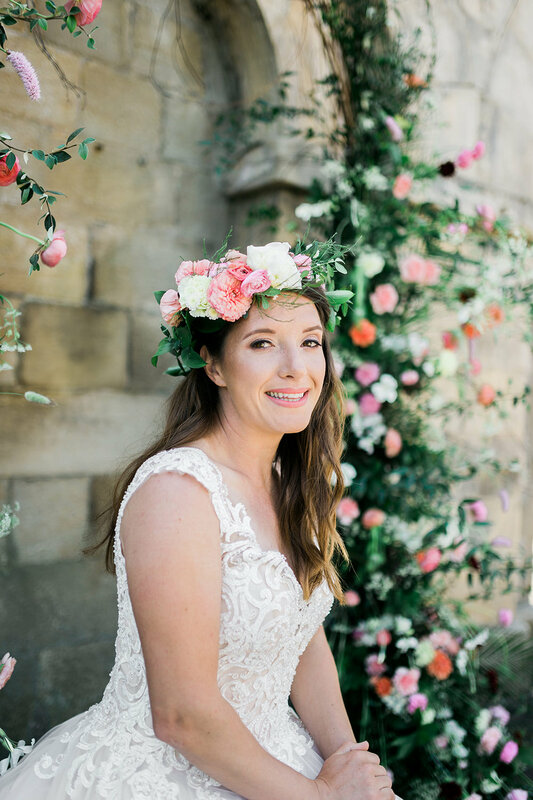 The glam team Lottie Haigh Hair and Faces Make Up created the most feminine look using accessories from The Bobby Pin and the amazing flower crown from Yves & Yaro. 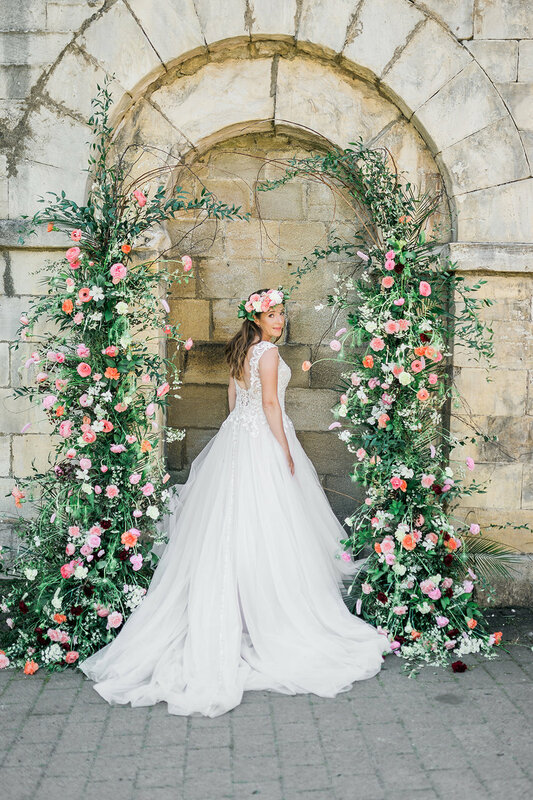 The floral arch Yves and Yaro created was simply breath taking the arch's in the court yard of the castle were the perfect back drop. Our floral designs are predominately influenced by the ever-changing seasons. 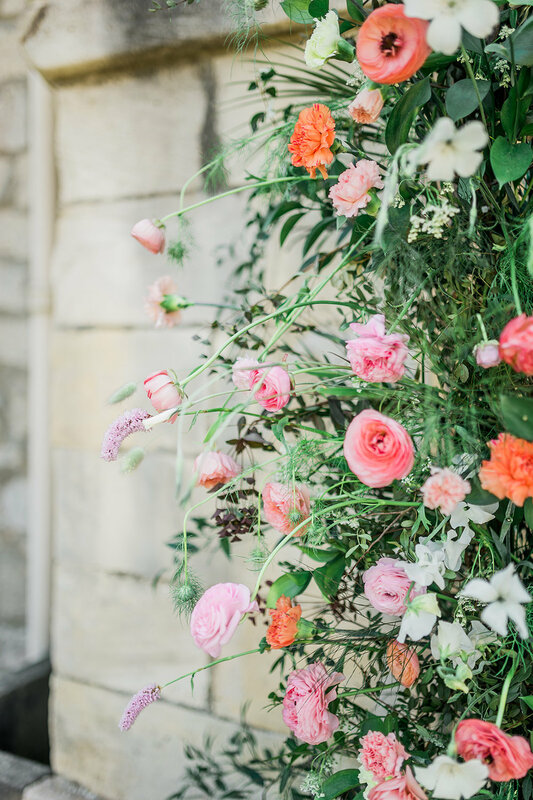 We focus on sourcing British flowers for our clients because they are naturally charismatic, beautiful and have that ‘just-picked’ freshness which make them our favourite. For the arch, we used burgundy as our transitional colour to make the piece of work POP and really stand out amongst the peach tones, lilacs, blushing pinks and bold greens. For the circlet, we used bianco, salmon and rose ranunculus, and carnations… a flower which is often overlooked as antiquated. Our designs are full of seasonal blooms and texture and this is reflected in the body of this work. 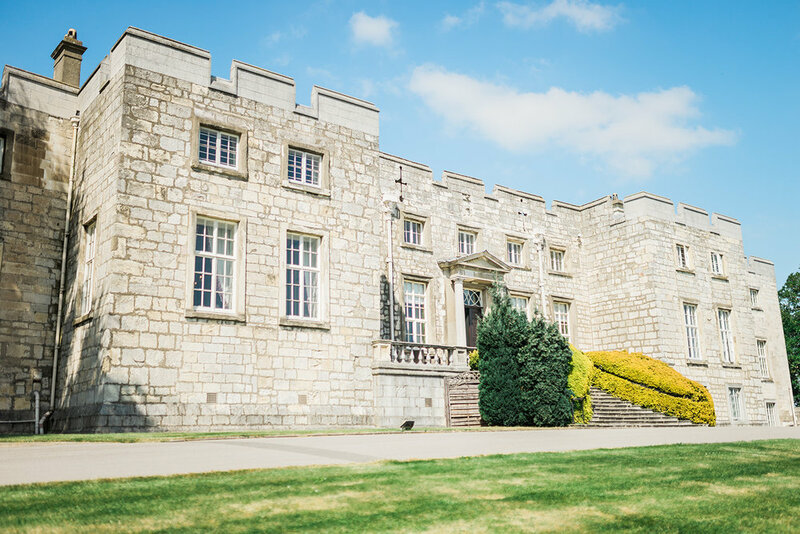 ''When it came to the stationery design for this shoot I really wanted to capture the delegate, elegant feel of both the venue and feminine colour scheme. The venue is so quintessentially English, I chose to use delicate water colour illustrations of a classic english rose as the base of my design to also act as a subtle nod towards their beautiful gardens and countryside setting and to pick up on the detailing of the floral design. I love the feel of these invitations as they are printed on the finest Italian papers giving it that luxury feel. For the finishing, I chose a technique called deckling, which again really added to the fine art nature of this editorial, which when teamed with the deep navy hand died silk ribbon from Northern Hands gave a real richness to the invitation suite and adding contrast to the muted blush tones of the illustrations. To tie it all together I chose a dark navy envelope finished off with a blush wax seal and beautiful calligraphy from Sally Jane Calligraphy, who is also Yorkshire based. I really love experimenting with how far you can push a design into your 'on the day' items and so came up with something a little different for our table plan. I'm always open to ideas so please ask the question and I shall work with you to come up with something beautiful that works for you and your wedding. 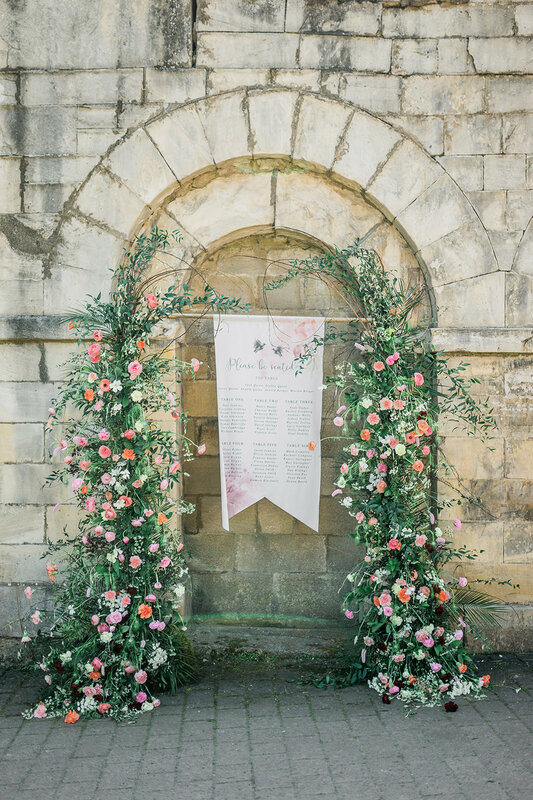 The table plan was a real showstopper in the form of a banner featuring the same design, shaped to look as though it could be hung in Hazlewood Castle itself. 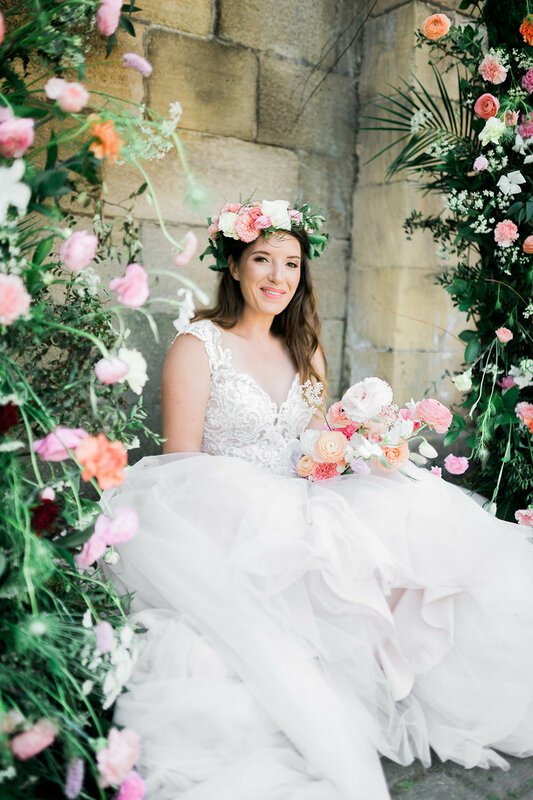 With the help of Ambience Venue Styling York, it took pride of place under their beautiful cherry blossom tree situated in the courtyard but could easily work in various locations around your chosen venue. 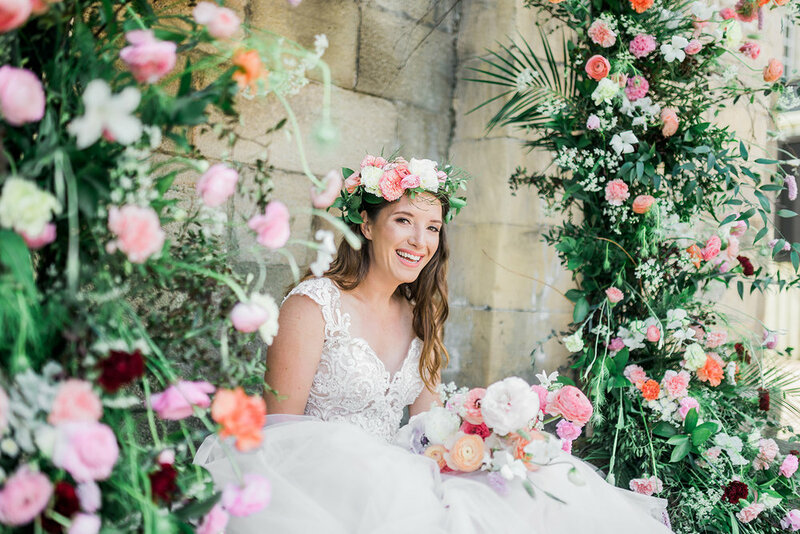 The romantic chic bridal bouquet was created using oodles of different varieties of ranunculus, bunny tails grass, persicaria, anemones, sweet peas, fritillaries, agrostemma and; the touch of blue Nigella lifts the bouquet slightly. 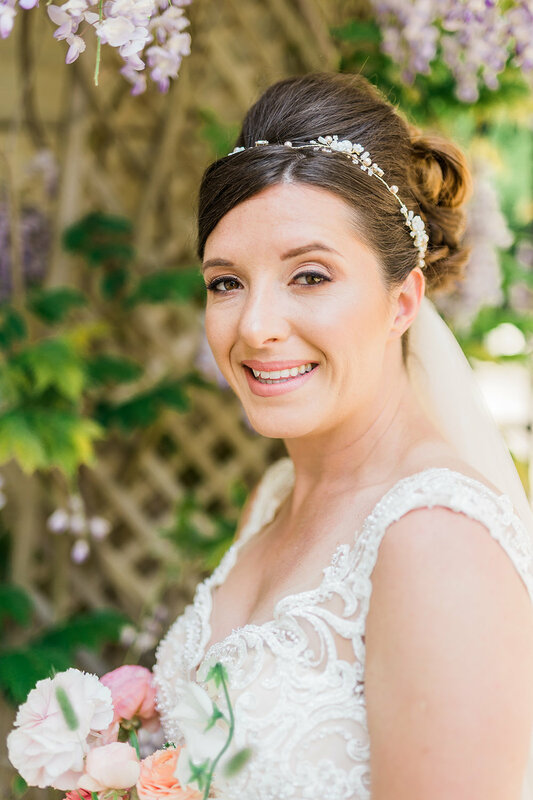 We used a white habotai silk ribbon as an elegant addition to the bridal bouquet which is a romantic fabric that allows for wispy movements in the breeze.